The Diamond Jubilee rolled on Saturday with a spectacular tribute to Her Majesty from the armed forces, with a parade and muster from more than 2,500 servicemen and women and a flypast. The event united the Royal Navy, Royal Air Force, and Army. 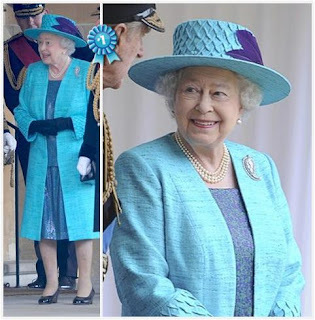 Well, this outfit won't be coming near the top of my list of favorite QEII outfits anytime soon, so we'll focus on the positive: the brooch! Several royal ladies in attendance were wearing regimental brooches, but the queen took this opportunity to wear one of her mother's brooches (diamonds in the shape of a palm leaf, also referred to as a paisley motif) - a subtle tribute all the same. I can't help but think that the Queen Mother would have simply adored this particular event. I think Sophie stole that hat from Zara Philips, while Princess Michael may have stolen hers from a biker bar. Silvia's purely fabulous in her over-sized chapeau and Sonja's working her usual half-spaceship topper, but Margrethe takes this prize: chic and sassy, Daisy! The best part of a military parade is the military uniform (sartorially speaking, of course). It's too bad the foreign royals didn't have the same dress code, but there are plenty of handsome British gents to occupy us instead. Prince Philip wins because of general awesomeness, and also because I would die to know what he thinks about some of his guests these past two days. Yes, that's right, the uniforms win for the gents and the ladies. There were some seriously lovely pale blues happening at this event (honorable mention to the unpictured Crown Princess Katherine of Serbia here as well) and one fab hat on Maria Teresa, but nobody beats the perfection of Anne in a uniform. Who will entertain me when our friend here goes back to Sesame Street and leaves us with only sensible royals and understated outfits? Sigh. So long and farewell, Mrs. Swaziland. Who stands out at the parade for you? P.S. 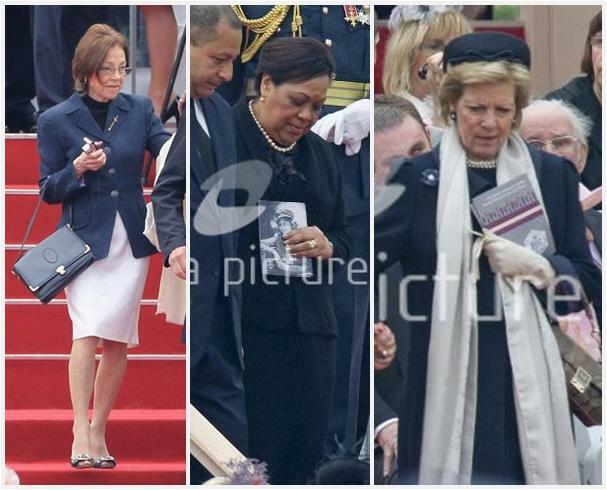 : No, the Prince of Wales, Duchess of Cornwall, Cambridges, Harry, Beatrice, and Eugenie were not in attendance. Also, not all the foreign sovereigns stayed around to participate in this event. P.P.S. : This replaces our Sunday Brooch feature for the day. Tomorrow we'll have a look at the Danish royal christening.